Provides funding for any graduate education at Stanford, including leadership and mentorship opportunities. 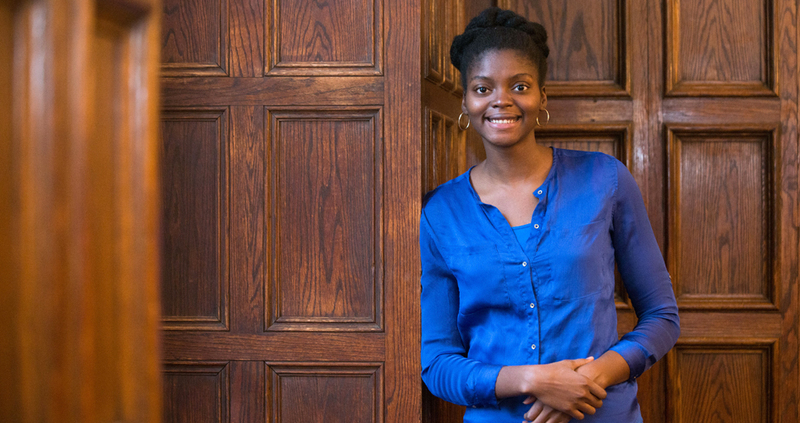 Congratulations to Ade Ayoola, UChicago's first Knight-Hennessy Scholar! You can read more about her success here. The Knight-Hennessy Scholars Program is designed to build a multidisciplinary community of Stanford graduate students dedicated to finding creative solutions to the world's greatest challenges. Each year the Knight-Hennessy Scholars program will identify a group of 100 high-achieving students from around the world with demonstrated leadership and civic commitment to receive full funding to pursue a wide-ranging graduate education at Stanford, with the goal of developing a new generation of global leaders. The Knight-Hennessy Scholars is the largest fully endowed scholars program in the world. In addition to the opportunities that students will pursue through the Knight-Hennessy Scholars Program, they will find ample opportunity to build leadership skills specific to their discipline. The Knight-Hennessy Scholars Program funds up to three years of your graduate education. If your degree program exceeds three years, such as an MD or PhD program, then your home department will fund the remainder of your education to the extent consistent with its standard funding commitment for that program. a generous stipend comprising your on-campus room and board, books and supplies, health insurance and associated fees, travel to and from Stanford, and reasonable personal expenses. The Knight-Hennessy Scholars Program is open to citizens of all countries. While there is no minimum GPA for the Knight-Hennessy, you must meet the minimum GPA expectations of your degree program for Stanford admissions. Generally, competitive candidates for a fellowship like the Knight-Hennessy will have a minimum cumulative GPA of 3.7 or higher from their undergraduate institution. The University of Chicago will not endorse undergraduate candidates for the Knight-Hennessy with a GPA below 3.5. You are eligible to apply to the Knight-Hennessy Scholars Program if you are applying to enroll in a full-time graduate degree program at Stanford (e.g., JD, MA, MBA, MD, MS, or PhD) or plan on pursuing one of Stanford’s many joint- and dual- graduate degree options (e.g., MD+PhD, JD+MA, MBA+MS). The Knight-Hennessy Scholars Program funds up to three years of your graduate education. If your degree program exceeds three years, such as an MD or PhD program, then your home department will fund the remainder of your education (to the extent consistent with its standard funding commitment for that program). One year programs are ineligible. You are eligible to apply to the Knight-Hennessy Scholars Program if you earned your bachelor’s degree in 2014 or later. Even if you have earned a graduate degree already, you are eligible for consideration as long as you earned your bachelor's degree in 2014 or later. Beyond the eligibility requirements listed above, you are eligible for the Knight-Hennessy Scholars Program as long as you meet the requirements of the Stanford graduate program that you wish to pursue. You must complete the entire application process for your department - including any standardized test that your discipline requires (GMAT, GRE, LSAT, MCAT, etc.) and, if needed, an English proficiency test. All current University of Chicago undergraduates applying for the Knight-Hennessy must submit a campus endorsement application. Graduate student candidate should work directly with Karen Rosenthal, Director of Fellowships in UChicago Grad. Recent alumni are welcome to apply directly to the Knight-Hennessy Scholars program, but we strongly encourage you to seek CCRF advising support. Campus Endorsement Application Process: Before you begin your campus application process, please consult carefully the Knight-Hennessy Scholars Program website. (1) Current UChicago Undergradudate must secure campus endorsement: If you would like to be considered for institutional endorsement and to secure the required institutional statement of support, you must submit a complete campus endorsement application, which will undergo a thorough review. Complete instructions and the online application is available here. (2) UChicago Alumni: Alumni are not required to apply for campus endorsement. Please carefully review the Knight-Hennessy application requirements - particularly the letters of recommendation section. You will abide by the same Knight-Hennessy and Stanford deadlines/processes as described on the Knight-Hennessy Scholars Program website. CCCRF staff is available to help in your application and essay review in advance of the respective deadlines. All candidates must apply to their respective Stanford University graduate programs, following all of the instructions of their program and/or department. This may include providing writing samples, additional letters of recommendation, official academic transcripts, and standardized test scores. Stanford Deadline: All candidates for the Knight-Hennessy Scholars Program MUST SUBMIT their Stanford University admission application by the Knight-Hennessy stated deadline of your selected degree course. Please review the Knight-Hennessy website carefully regarding these deadlines. You must defer to this deadline (not your own departmental or program deadline) in order to compete for the Knight-Hennessy Scholars Program. The Knight-Hennessy Scholars program will not accept deferals. You should only apply to the Knight-Hennessy Scholars Program if you are intent on taking up your graduate place at Stanford University. As a part of the national application, candidates will submit a brief video of introduction. If selected as a national finalist, candidates will participate in an immersion weekend, which includes an interview for the Knight-Hennessy Scholars Program. The CCRF will support all finalists - current students and alum - in preparing for national interviews. Additional notes: you will apply to the Knight-Hennessy Scholars Program and also apply separately to the specific Stanford graduate degree program that you want to earn. If you’re admitted to both, then you enroll in your Stanford home program as a Knight-Hennessy Scholar. Your home department will not see your Knight-Hennessy Scholars application. The Knight-Hennessy Scholars team will review your Knight-Hennessy Scholars application and will have access to your departmental recommendation letters and personal statement.